1. "Beautiful Location and A Gem of A Guide"
I took the 1 day Huanghuacheng hike and it more than exceeded my expectations. The location was pristine, untouched and Sonia and I were practically the only people on the wall. The Great Wall really lived up to its reputation as one of the Seven Wonders of the World. This beautiful location would not have been great if it wasn’t for Sonia. She pre-empted all my needs and addressed them with great professionalism. She took the initiative to take pictures for me so that I could focus on enjoying and appreciating the breathtaking location. Being a solo traveller, I am always weary about what unruly characters and situations that I may encounter along the way, but with Sonia I can put my guard down and have peace of mind that I am in good, sincere and honest hands. I am so blessed to have made this decision to take this trip, which is definitely the highlight of my stay in China. Couldn’t have asked for more. Thank you so much Sonia! 2. "Really Nice Hike at Huanghuaceng Great Wall"
I went to Huanghuacheng Great Wall together with Sonia just the other day. Really nice to come away from all the smog in Beijing for a while. The track was not extremely challenging, but that suited me quite well since that left more space for photography. You don´t have to be an experienced hiker to appreciate this kind of trip. I guess you couldn´t ask for a much better guide than Sonia; good local knowledge, very kind and considerate, service minded and with decent English. I will most certainly go with China Travellers again. I am an expat based in Beijing and I had a group of family members come to visit me in Beijing this April. The Great Wall was a must see for all of us, as I had never been. We scheduled a trip through China Travelers A mere four days before the trip. Our guide Sonia was incredible. I could not have imagined a better tour. We opted for the more challenging hike, and we were the only ones on the wall! She took us to "Yellow Flower Wall" a part of the wall that is broken and untouched in some places. This was a fun and breathtaking adventure and the lunch we had afterwards (included in the fees along with transport) was fantastic! I will be bringing more friends along to hike with Sonia in the future! 4. "Great Experience Climbing Huanghua Wild Great Wall"
When my friend and I were wondering whether our driver took us to the wrong place, we met Sonia. She told us we were at the state-owned Huanghua Water Wall Park, not Huanghua Wild Great Wall. Seeing us upset, Sonia kindly offered to take us to the real Great Wall. Thanks to her, we found the place and had a great experience! We loved the wilderness ( the authenticity) of the Great Wall--it is truly walking "the history". Sonia explained to us its history, told us interesting stories about the old peasant woman who had guarded the entrance for fourteen years. She is a kind and genuine person, and it’s so much fun to take a trip with her! On Thursday Sonia took me to the Huanghuacheng section of the Great Wall- a beautiful part of the wall a few hours outside of Beijing. This section of the wall is devoid of the clamber of tourists and locals trying to sell you things. 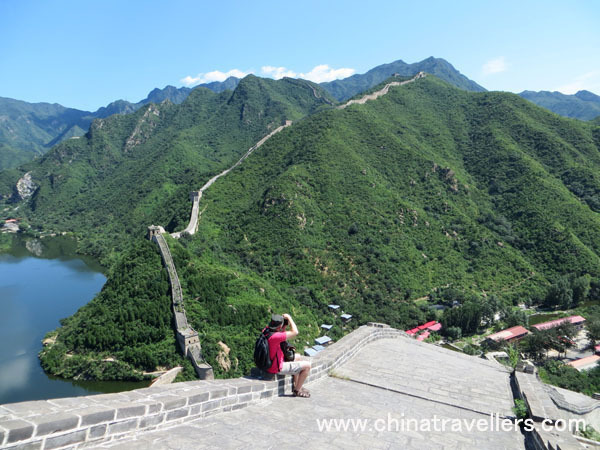 The wall is unspoiled by tourism, and from the peaks you can feel the majesty of the natural surroundings and marvel at the wall’s construction. It is a beautiful way to escape from the hustle and bustle of Beijing (and the air quality!) and reconnect with nature in all its splendor. Sonia coordinated everything and was very patient with my ever changing schedule. We arrived at the wall around ten and hiked until the early afternoon. We had lunch with a local family (one of my best meals in China) before exploring the village and heading back to Beijing. This section of the wall is very peaceful, we didn’t encounter anyone other than a few Chinese hikers. The wall is not completely restored, which gives a bit of humility to this great structure. After living in Beijing for three months, this trip was a much needed retreat from city life. Far from the sounds of cars or buses, the birds and the wind provided our only musical accompaniment. How delightful it is to hear oneself think again! My only regret is that we did not stay longer! This walk - about 3 hours to partly restored, partly overgrown wall - is a must! Great views, great mountains and exciting hike. All super organized and I highly recommend China Travellers: I WAS THE ONLY GUEST! (All others said spontaneously, fearing rain, in truth, was it the best weather!) So I came to enjoy a private tour of Sonia, the price remained the same. At the end, they organized a delicious 5 course meal under the trees of a peaceful village, and then I was sure chauffeured back. 7. 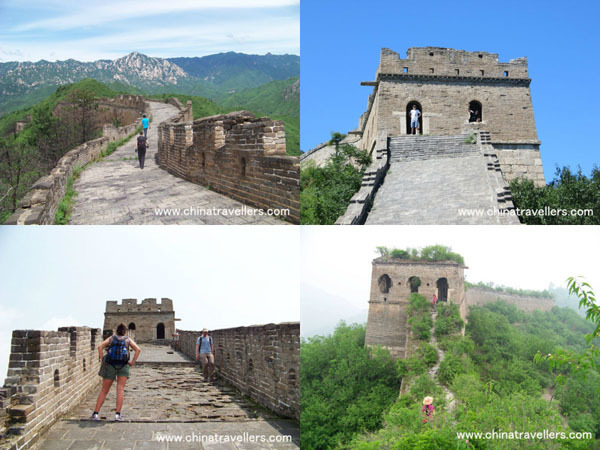 "...Offside the Mainstream: The Great Wall, Sonia and Me"
A really great Great Wall trip beside the masses - trust Sonja the guide, she will bring you to the hidden tracks. Okay, if you prefer a hike-trail - la Disneyland - stop reading here. If you prefer close contact to nature and little villages with its unique people and of course Great Wall sectors which have still an arcane aura - go ahead - because that is what you can expect making a tour with Sonja from "China Travelers" - even if you forget to bring your hat or some sun-blocker (what I really recommend not to forget) - Sonja is well prepared even for such cases. I got luck on "my day" and we were totally alone during steppin´ ancient stones in bright sunny weather at Huanghuacheng. The comfortable bus-ride when you start let you escape the hazy "fog" and all the city-hassle......you will cruise towards the mountains on a easy small country road. On the peak a fresh breeze will cool down the heat - nothing comes for free - to get to this place you have to do some steps upward the hike-trail before. And they are more than worth to do - because a beautiful view over the hills is waiting for you and here you can take a deep breath in your lunges. Even for an unexperienced hiker like me the path is doable for everyone. I can definitely recommend Sonja´s hikes. You are in very good hands. 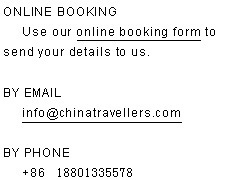 If I should make a trip again I will definitely go with "China Travellers" again.